JAMES Rodgers raced to a crushing victory in the Glastonbury 10k road race yesterday. The North Somerset AC runner finished 59 seconds clear of Matthew Cox as he clocked 33mins 40secs in windy conditions with Thomas Priest third. Leading woman in 43rd overall from 650 finishers was Debbie Reading (41:14) from Team Bath veteran Jo Thompson (41:49) with Charlene Hurcum of Portishead Running Club third (43:33). 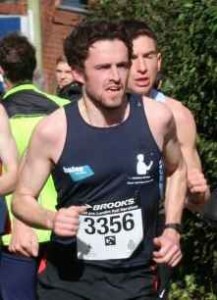 BRISTOL & West AC’s Pete Le Grice has soared to second in the South West Rankings after a superb debut in the Virgin London Marathon. The Penzance-based hotelier delivered a five-star performance in his first effort at the classic 26.2 miles challenge completing the course in a time of 2hrs 23mins 16secs. “I am absolutely thrilled by my first attempt at the marathon,” said Le Grice, who finished 14th and top west man in the club event. En route Le Grice also posted a PB time of 69mins 59secs at the half-way mark, eclipsing his previous best of 70mins 30secs set in the Plymouth half two years ago. “It did worry me a bit at the time but I wasn’t feeling too bad at all and managed to maintain a decent, even pace as I chugged around and then before I knew I was at the finish,” he added. “But the support on the course was fantastic and it was just a terrific experience. Clubmate Jarlath Mckenna, a former winner of the Easy Runner/Bristol Post athlete of the month competition was also delighted with his London as he ran a personal best of 2:24.12. THE surprising news confirmed recently was that the Bristol + Bath Marathon has been cancelled this year – despite a successful launch in 2015. The inaugural event, which started in Bristol city centre and finished in Royal Victoria Park, Bath, confounded expectations when it attracted several thousand entries. Around 4,000 people had pre-registered for the 2016 race so it was a shock when Bath-based organisers GO2 Events announced it was being axed as they could not secure adequate road closures. Jamie Warren of GO2 said: “The Bristol + Bath Marathon was a real standout event for runners in 2015 and we have worked closely with our partners and the three councils involved to confirm its return. “We appreciate that this announcement will be disappointing for runners hoping to take part in 2016, however with over 4,000 people already pre-registered for the events’ next installment, we know there is huge appetite for its future return. FOR Rebecca Hilland it was mission accomplished as she celebrated her debut in the Virgin London Marathon with an excellent time of 2hrs 39mins 45secs. 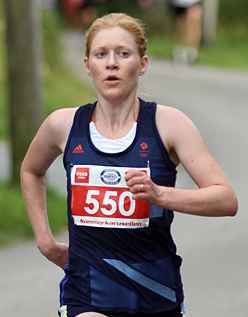 The 35-year-old Team Bath AC runner’s decision to fly over from her home in Norway or the race as fully vindicated as she recorded a time that earned her fifth place overall in the women’s club race put her top of the South West Rankings. “Beforehand my plan A was to try and run under 2hrs 40mins but I was well aware that anything can go wrong in the marathon,” said Hilland. “Plan B was to run under 2:45 – so I am delighted that plan A worked! My legs felt fine and perhaps I should have gone faster in the first half (which she reached in 79mins 29secs) but that is a judgement call. Hilland ran alongside clubmate Mike Dooley for the opening 10k but the Army man dropped away after that and finished outside his target of breaking 2hrs 40mins.But former British junior international Hilland maintained her momentum and pace as she relished her first experience on the streets of the capital. “I had heard so much about the crowd getting the runners going and now I know that for myself as the atmosphere was brilliant,” added Hilland. ENTRIES are being taken for the 2016 Avon Track & Field Championships at Yate Outdoor Sports Centre on Sunday May 15th. The closing date for entries is next Sunday (May 8th). It should also be noted that the Under-13 and Under-15 800m championships for both boys and girls will again be held as part of the Avon AA Open Meeting on Tuesday 24th May but competitors for this event need to enter using the entry form for the main championships. TERRY Haines, widely regarded as Mr Gloucestershire Athletics, has retired from the sport. “I am 73 now and I have to go sometime and I would rather go now than taken out in a box – which does happen! His energy, drive and firm opinions soon established Haines as one of the main personalities in county athletics. “My aim was always to serve the athlete and I would like to think the example I set in organising events that were friendly, helpful to club athletes and cheap to enter will be maintained but I am not optimistic,” added Haines. “I am very concerned about what is happening with commercial companies increasingly taking over events. I believe the whole ethos of that is wrong. “But locally I am proud of what I created and believe I catered for the needs of athletes.